Batting stars: Ted Uhlaender was 2-for-5 with a double. Harmon Killebrew was 1-for-2 with two walks. Pitching star: Jim Perry pitched a complete game, giving up two runs on four hits and one walk and striking out six. Opposition stars: Lee Maye was 2-for-4 with a home run (his seventh) and a double. Casey Cox pitched two shutout innings, giving up one hit. Darold Knowles struck out two in two shutout innings, giving up two hits and two walks. The game: The Twins got all the runs they needed in the first inning. Uhlaender led off the inning with a double and went to third on a ground out. Tony Oliva's RBI single put the Twins up 1-0. He went to second on a wild pitch. Killebrew then walked and Rich Reese was hit by a pitch, loading the bases. A walk to Charlie Manuel forced in a run and Johnny Roseboro delivered a two-run single to make it 4-0 Minnesota. The Senators did not get a hit until the fourth, when Maye led off with a double but did not get past second base. They got on the board in the fifth when ex-Twin Zoilo Versalles singled and scored from first on a pinch-hit double by Mike Epstein. Maye homered in the sixth to make it 4-2, but that was the last Washington hit of the game. 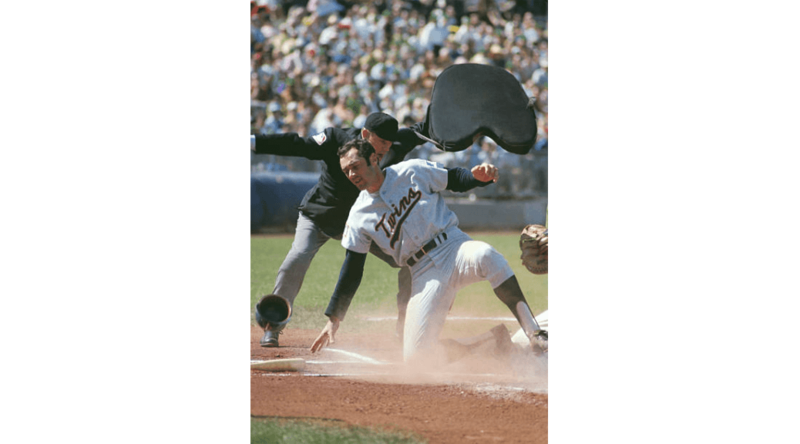 The Twins loaded the bases in the seventh on a walk to Killebrew, a single by Reese, and a walk to Rick Renick, but they did not score and the runs were not needed. WP: Perry (16-5). LP: Joe Coleman (9-11). S: None. Notes: Uhlaender was in center field again, with Cesar Tovar at second base. Frank Quilici came in for defense in the eighth. He went to second, with Tovar going to center and Uhlaender to left in place of Manuel. Reese went 1-for-3 and was batting .331. Oliva was 1-for-4 and was batting .317. Perry's ERA went down to 2.92. Uhlaender had a ten-game hitting streak. He was 15-for-42, an average of .357, and had two hits in each of the last four games he started. This was only the second game Manuel had started since July 20. The home plate umpire in this game was Jake O'Donnell. That's the same Jake O'Donnell who was a referee in the NBA from 1967-1995. He umpired in the American League from 1968-1971. He's the only person to officiate a major league baseball all-star game and an NBA all-star game. He also umpired the 1971 ALCS. I know the seasons didn't overlap as much back then, but I still don't know how he did both. Record: The Twins were 77-51, in first place in the American League West, three games ahead of Oakland. They had won five of their last six games.